Citizen reporting is a valuable way to gain an understanding of the issues a community is facing. This knowledge can influence the public narrative and even policy. But doing timely citizen reporting on a large scale can be challenging. For the November 2018 midterm elections in the United States, Democracy Labs, an organization that operates as a technology and innovation hub for progressive causes, wanted to ensure that citizens could report, in real time, any voting issues that they encountered. Whether they were ballot problems, voting machine issues, closed or moved polling places, long wait times, or other disruptions, the team at Democracy Labs (also known as DemLabs) sought to find these reports quickly enough so it could verify them and alert the media of any major problems or patterns. Via See Say, Democracy Labs recorded 623 voting issues during the 2018 US midterm elections. But it was just 11 days before the midterms, and DemLabs found out that there were no mechanisms available to do real-time reporting on election issues. 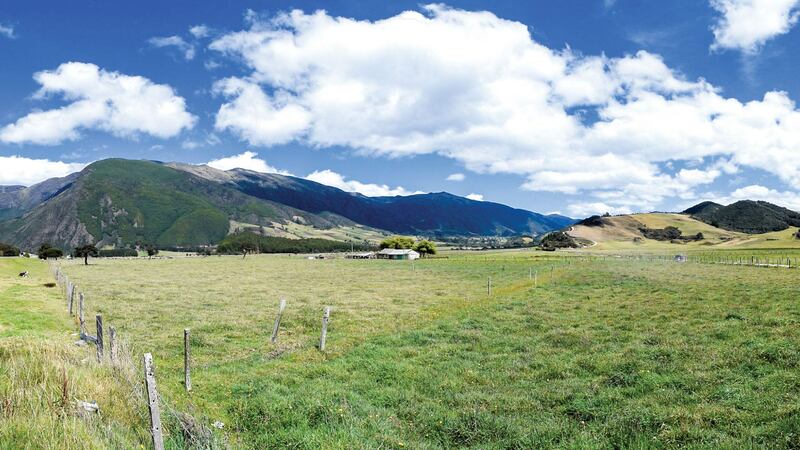 With a tiny budget, the small team decided to build something using Esri software. It created its system—called See Something, Say Something, or See Say for short—using Survey123 for ArcGIS for data collection and an Esri Story Maps app for presenting its findings to the public. Then, it had to get the word out in a big way to ensure that voters and election observers knew where to report problems on Election Day. Make it easy for voters and election observers to report problems from their smartphones. Be able to handle a large number of reports within a short time (i.e., on Election Day). Enable voters, DemLabs volunteers and partners, and members of the media to access the system remotely and simultaneously. Present voter issues in a clear and easy-to-understand manner. DemLabs has been an Esri user since its founding in 2017, so the organization had a stack of geoenabled software and apps to choose from. The team decided to build its reporting app using Survey123, taking advantage of the app’s simple, location-based smart forms. 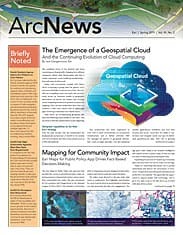 When citizen reporters submitted their issues via the form, the data would feed directly into ArcGIS Online, where it was automatically mapped in a staging area. To ensure that all the submissions were valid, DemLabs planned to have a group of volunteers screen every report that came in before releasing it to the public-facing map, which would be hosted in a tabbed Esri Story Maps Series app. This would make the reports and findings easy for the media and the public to visualize. They could view them all in one map or take a more focused look at distinct issues by clicking on the various tabs. The DemLabs team decided to build its reporting app using Survey123 for ArcGIS, taking advantage of the app’s simple, location-based smart forms. While the system did not provide legal help, it included information for whom to call or text. Once the Survey123 form was built, the next step was to promote it so that voters knew it existed. DemLabs connected with several groups to share See Say across a range of channels. The local affiliate of NBC in the San Francisco, California, area did a report on the app, and the Open Source Election Technology (OSET) Institute, which had experts embedded with NBC News and MSNBC on election night, advised people to use See Say to report voting problems so its team could monitor any big issues. Television personality Samantha Bee released a political trivia game just before the midterms and added See Say as a challenge to it to encourage its more than 310,000 players to report voting issues if they encountered any. And organizations such as Rock the Vote and Center for Common Ground, which try to galvanize young and underrepresented people to vote, publicized See Say as well. On Tuesday, November 6, 2018, voters across the United States reported 1,133 election issues via See Say. Volunteers at DemLabs reviewed each report; removed submissions that were spam; and verified that the remaining reports came from valid User-IDs, had email addresses, and made sense. These screenings yielded 623 reports of voting problems, which were broken down into seven categories: ballot issues, closed or moved polling places, long wait times, poll worker issues, voter check-in issues, voter intimidation, and voting machine problems. From there, 63 incidents were deemed important enough to share with the media. 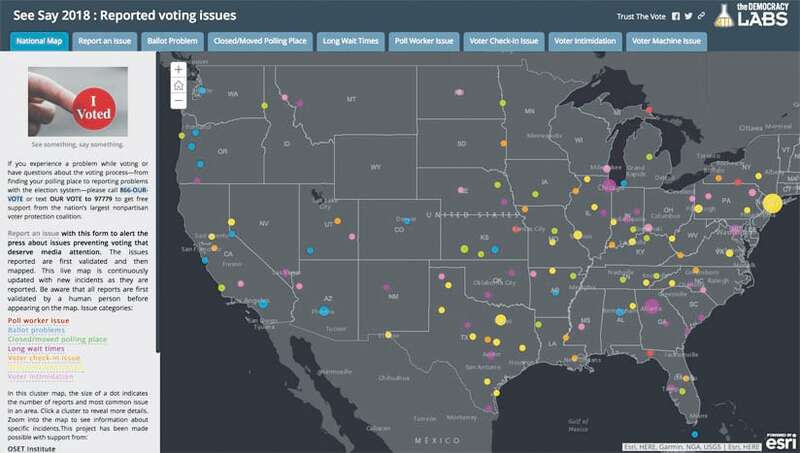 On Election Day and over about the next month, DemLabs’ map of voting issues received more than 248,000 hits. Viewers could interact with this publicly accessible story map. 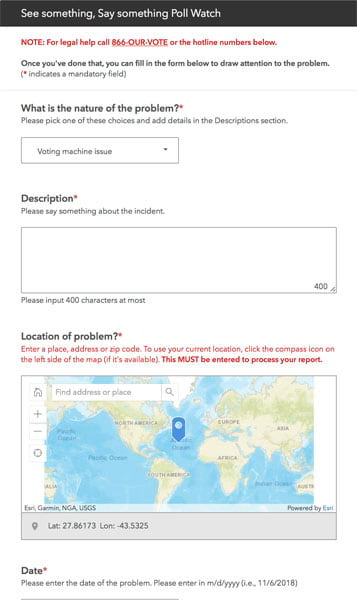 They could look at the different tabs to see a breakdown of each type of voting issue, click specific dots to find out more details about each complaint, and scan the entire map to discern whether there were any patterns in voting problems. Having location-based citizen reporting apps like See Say can give community issues some structure, more so than a melee of posts on social media. They can also make it easier to alert the media to potential stories so they can extend public awareness. Deepak Puri is the cofounder of DemLabs. 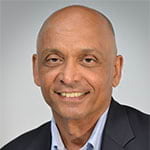 He is a former Silicon Valley executive, having worked for companies including Netscape, Oracle, and VMware, but he is new to GIS. Puri has a strong interest in how technology can be applied to promote social justice.